Words by Fiona Symington-Mitchell. Photo courtesy of Blackwoods Cheese Company. LONDON is a long way away from the picturesque rural community of the Yarra Valley in Victoria, Australia. Yet for cheesemaker, Dave Holton, it's proved the perfect place to co-found a small micro-dairy. 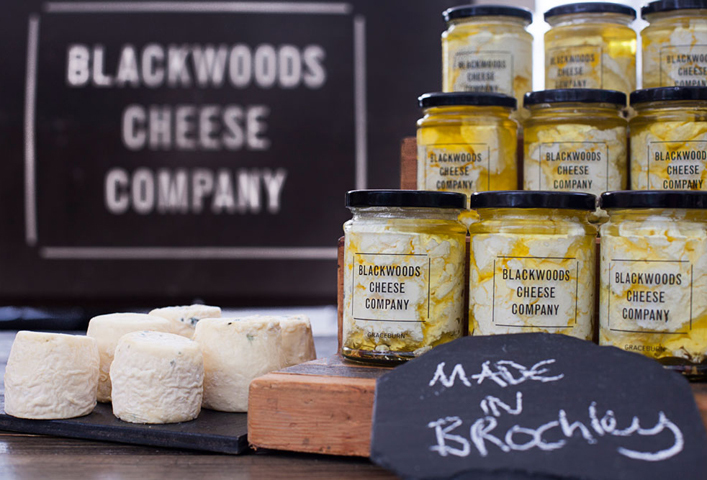 ​Blackwoods Cheese Company is in many ways a classic Antipodean story. Well almost. Three Aussie mates find themselves in London, eager for adventure, and decide (and this is where the story deviates) to set up a micro-dairy in a light industrial estate in south-east London. Having all worked together at the Yarra Valley Dairy, Dave Holton, Cameron Rowan, and Rory Holwerda saw the opportunity to specialise in raw milk soft cows cheese, starting with their version of the dairy’s signature Persian Fetta: a soft cheese marinated in garlic, fresh thyme, bay leaves, peppercorn and olive oil. (Cam has since returned to Australia with Tim Jarvis coming on board in April last year. Yet Blackwoods Cheese Company is more than a tale about boys from Oz. 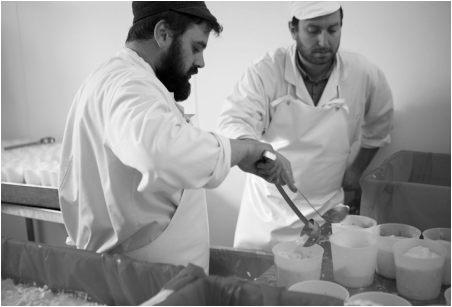 Their style and approach to cheesemaking is very much a mix of a home-grown experience with the UK’s farmhouse cheese industry. Firstly, there is the undeniable influence of the Yarra Valley Dairy and the shared rite of passage of all three founders from working and then training with the dairy. Their signature cheese – Graceburn has all the classic traits of Australian cuisine – a simplicity of taste, combined with a mixing of ethnic food influences, very typical of Melbourne. And then there is the name itself – Graceburn –the river near Dave’s home town of Healesville. As for their cheeses, all are made by hand with milk from Commonwork organic farm. 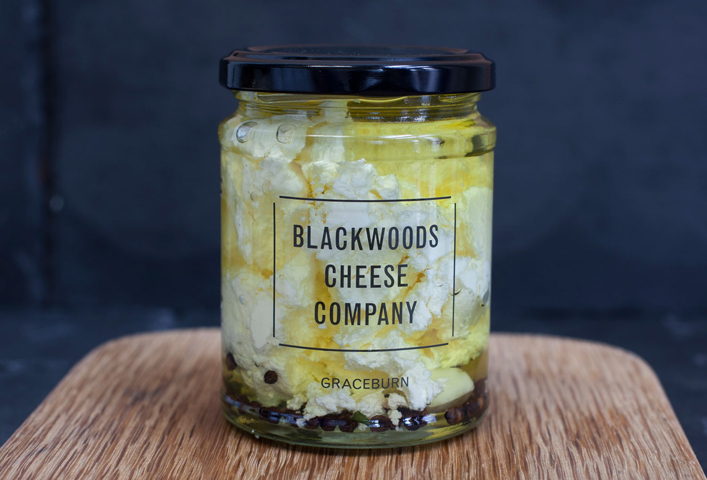 Their best known is Graceburn: the one that earned them early commercial success and is now stocked in stores like Selfridges, The Quality Chop House, and Fortnum and Mason. The Edward Tew and William Heaps form the convict series. Both cheeses are named after a convict whom was sent to Australia for stealing cheese among other things. The former is a ripened cheese, the first for Blackwoods, and the recipient of a gold medal at the recent British Cheese Awards. In contrast, the William Heaps is a fresh lactic cows cheese. Blackwood also sells fresh whey and cow's curd. As for the future, in September, Dave will leave Neal’s Yard to work full-time at Blackwoods with the aim of upscaling production, with him adding: “We just want to be able to make really good cheese and to have a life doing something that we really enjoy and that we believe in. That is fun and challenging at the same time”. You can find Blackwoods Cheese Company every weekend at Brockley Market, Crystal Palace Food Market, North Cross Rd Market, Dulwich and Herne Hill. You can find their list of stockists here. For the last four years, I’ve worked in Bermondsey at Neal's Yard in the maturation arches and so I‘ve seen all the businesses there grow almost from inception. So being around and involved has been fantastic. I’d also add Brockley Market as one of my favourite food areas in London. Getting a stall there was a big stepping stone for us, as it was our first real exposure to market. There is some fantastic produce there, including some from the guys at Spa Terminus. Brockley is a great market as it finds the right balance between producers and being able to get a bit of lunch and have a great Saturday morning. It’s really cheese, meat and beer. Fermentation is the thing that we are really interested in and finding other people that are interested in it whether that be milk, or barley and hops, or meats and sausages. So if we’re not getting our meat from Flock & Herd, we will get it from Nathan at The Butchery. I’d also include Adrienne Treeby of Crown & Queue for her delicious sausages. There’s Nick at Vadasz Deli who’s making proper raw unpasteurised pickles and there will also be some beers from The Kernel Brewery. Charlie Westhead of Neal’s Yard Creamery based in Hertfordshire. There is a great Afghan bakery on Old Kent Road in Bermondsey, where you can get these amazing wholemeal naan breads fresh from the oven for 50p each.